The panforte is in the oven. 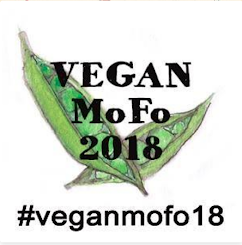 (A new recipe this year that I will share later.) Sylvia is refusing to sleep. I still have to wrap presents and tidy the house. Meanwhile I am taking a little break to tell you about the fun I have had with my food this Christmas. 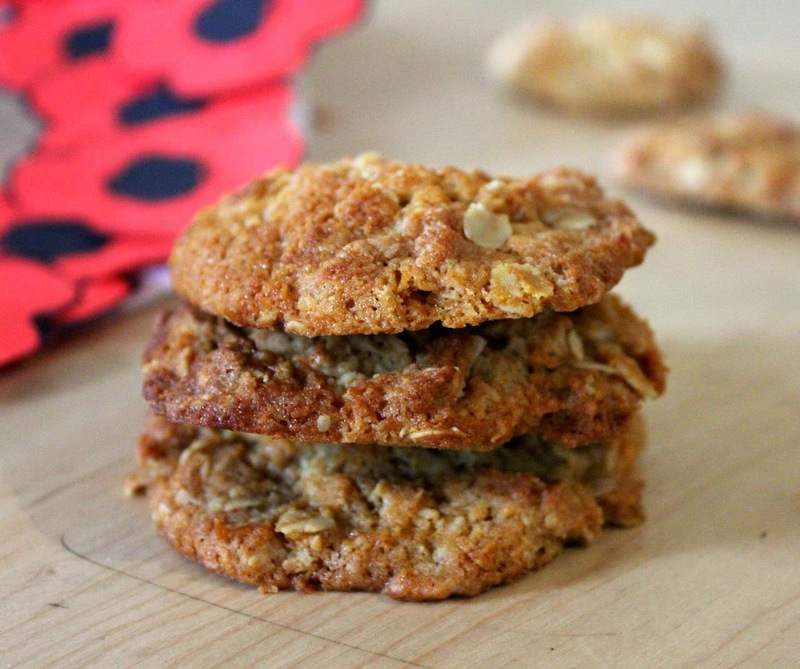 Take lunches for instance. They are usually rushed. But can still be fun. The top photo is the snowman sushi we made at lunchtime yesterday. Capsicum and cherry tomato hat, spring onion scarf, carrot nose (of course) and nori eyes and mouth. Plus a few toothpicks to keep him up. This lunch was a few weeks back. A rice cracker with cranberry eyes, cherry tomato nose, pretzel antlers and a few little BBQ Shape christmas tree crackers. Last night I made Christmas tree pizza. It seemed an early way to do dinner after a day of rushing about the shops and working on the gingerbread tree. I used my fast track pizza base , some pizza sauce from the freezer, a packet of grated cheese and some little cookie cutters to make some shapes. The pizza looked better when uncooked and the bottom looked a little like Jabba the Hut. No matter. It tasted delicious. It was fun. That is what matters! After dinner we went for a drive to look at local Christmas lights. I have never done this before. 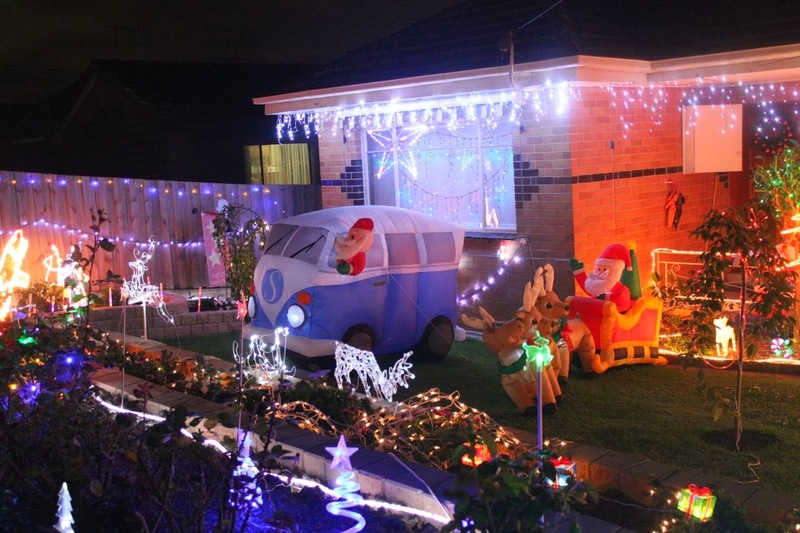 (Unless you count getting lost in search of the lights on the Boulevard in Ivanhoe.) Sylvia, rugged up in dressing gown) thought it magical. We loved Santa in the VW combie van above. I hope you are having a relaxed and happy Christmas eve and wish you the best for Christmas Day tomorrow. As the pesto Christmas trees use both an idea that I bookmarked and a recipe for vegan pesto that I bookmarked, I am sending these to Jac for Bookmarked Recipes. 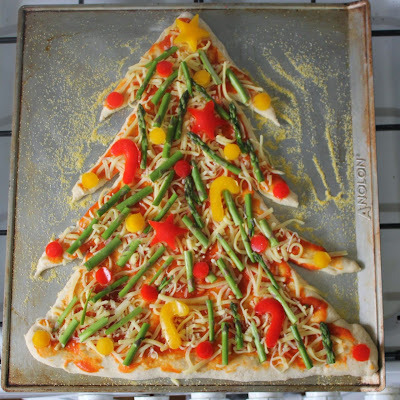 The snowman sushi and Christmas tree pizza are adorable!! 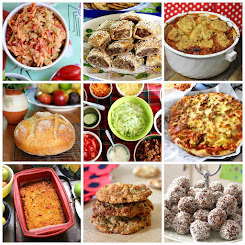 Busy Bee, that's going to be my new nickname for you:) Just look at the amazing food creations you have been making! 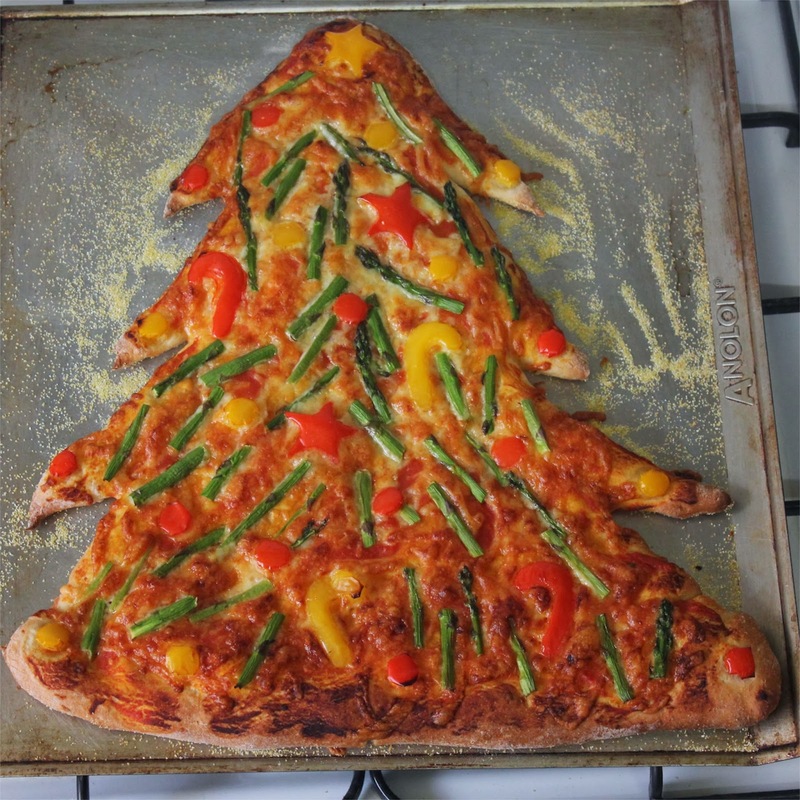 Love that Christmas Tree Pizza!!! 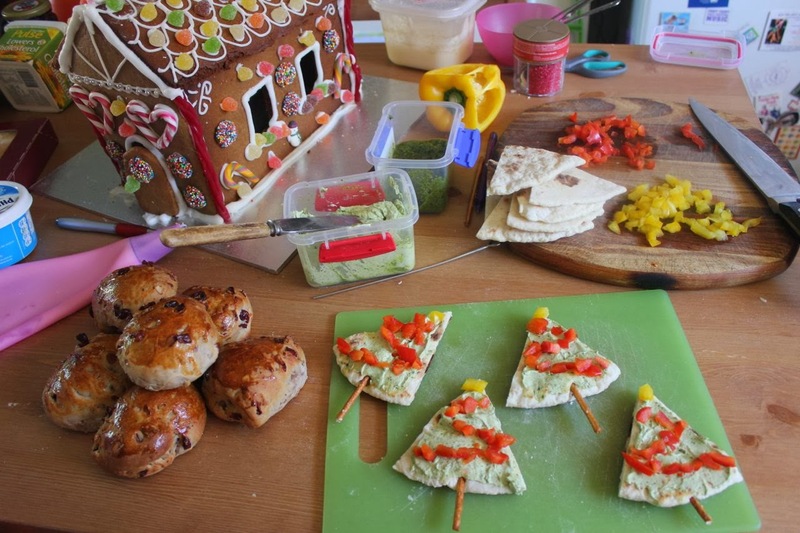 I absolutely love your Xmas food ideas! Especially the sushi snowman, my Sylvia would love that. Merry Xmas! 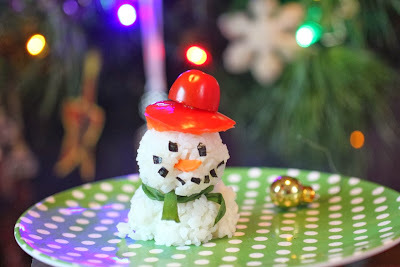 Love the sushi rice snowmen and that Christmas tree pizza is fantastic! 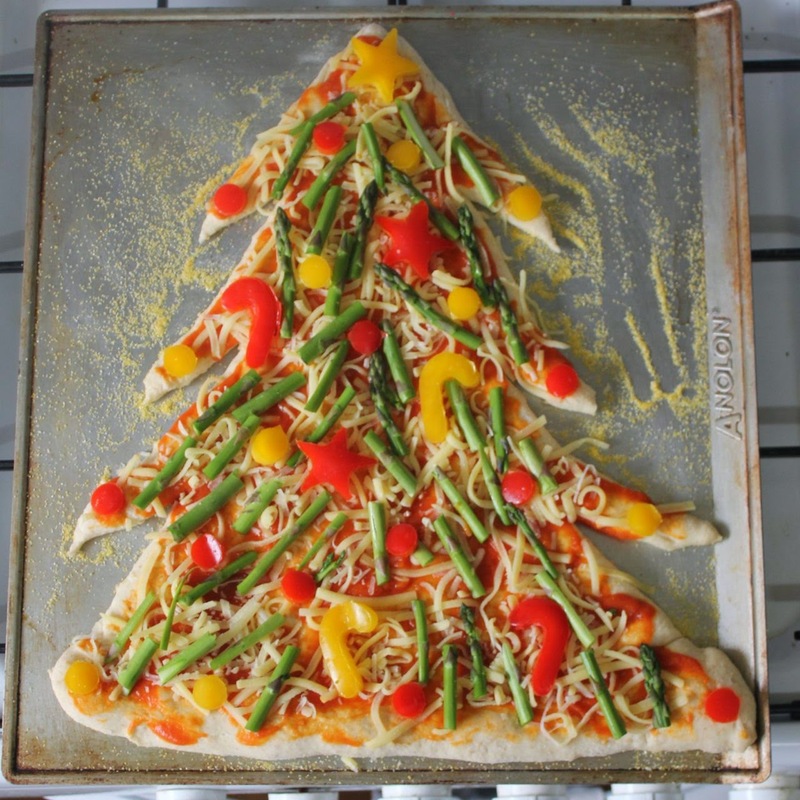 The grated cheese and colourful veg make it look so impressive, really like a tree with pine needles. Love the way you've bothered to decorate the dishes! 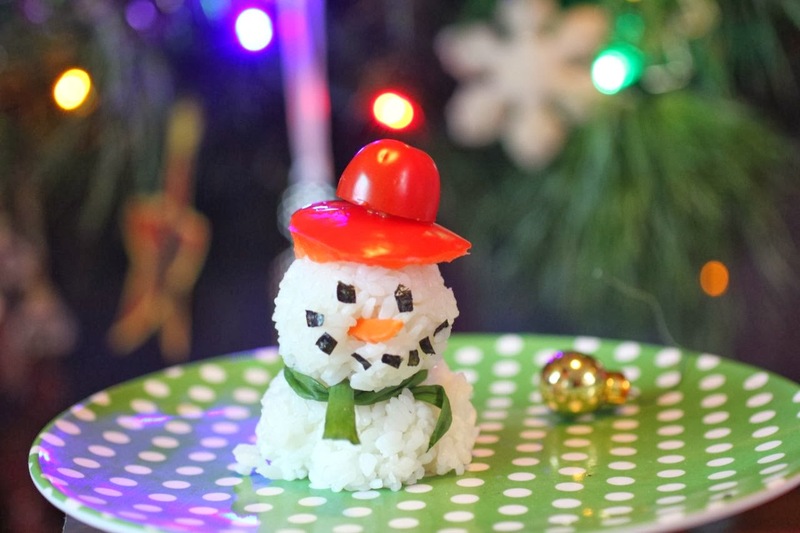 Especially the snowman sushi! Merry Christmas Johanna! I hope you and your family had a marvellous day. 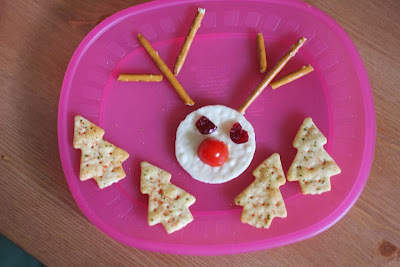 Love all the cute festive themed food. Cooper would love these trees! 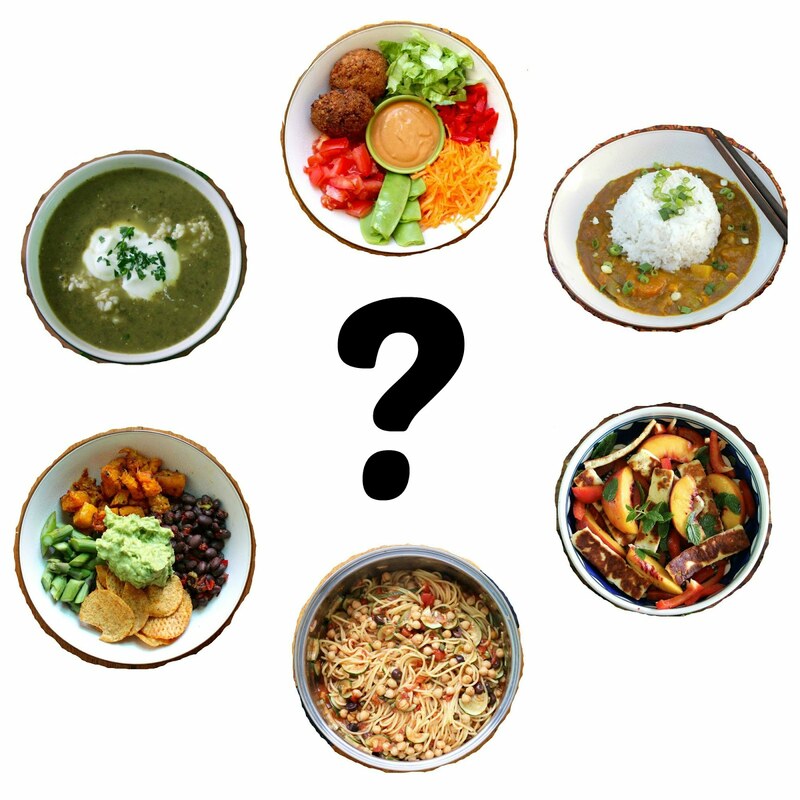 Can I ask what nooch is? 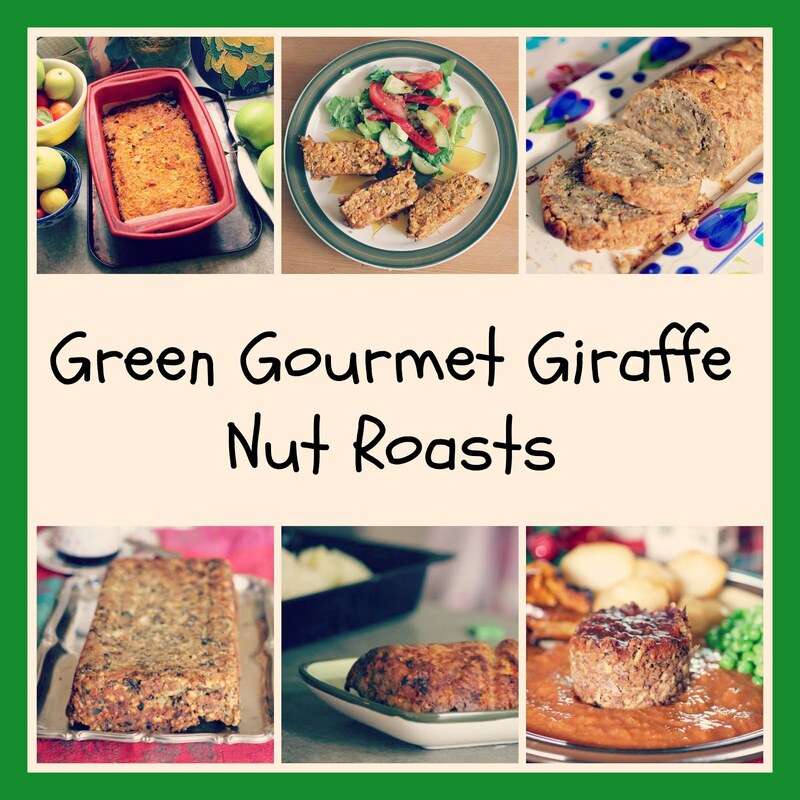 Anyway, thanks for submitting them to Bookmarked Recipes, the roundup is up and the new challenge open. It took me a while to get around to putting it up what with all my giveaways. Back to normal now thankfully. 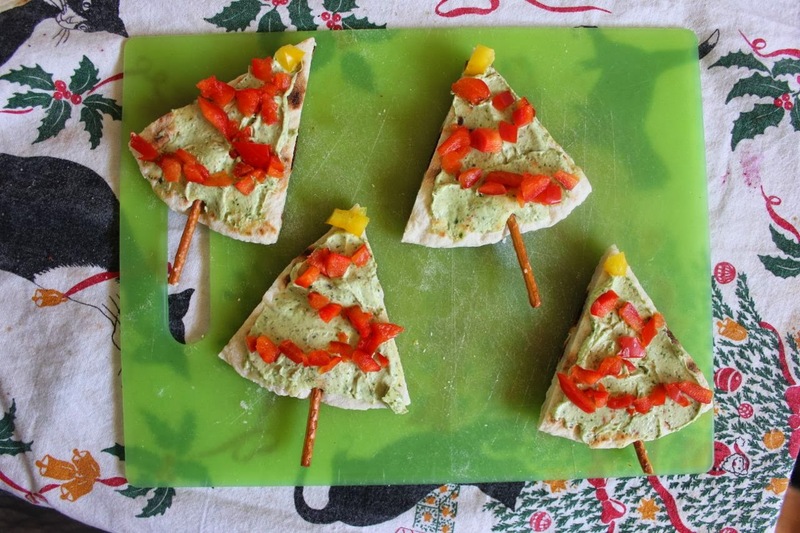 My goodness, I love all of your Christmas dishes - snowman sushi (haha) reindeer antlers (cuuuute), Christmas tree pizza (amaaaaazing), flatbread Xmas trees (too awesome...making me hungry now...!) 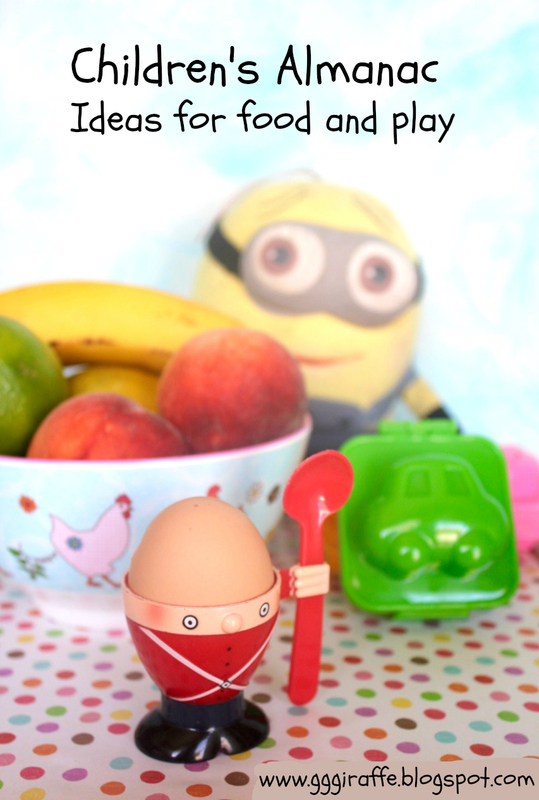 and what a lovely post…I’m feeling Christmasy now! Hope you had a fantastic holidays and wishing you a happy and healthy 2014!